Background: We performed dual-time-point positron emission tomography imaging in patients without evidences of mediastinal lymph node metastasis to investigate the characteristics of benign mediastinal fluorine-18-fluorodeoxyglucose (FDG) uptake. Materials and Methods: One-hundred and eighteen mediastinal lesions of 24 patients were included for this study. 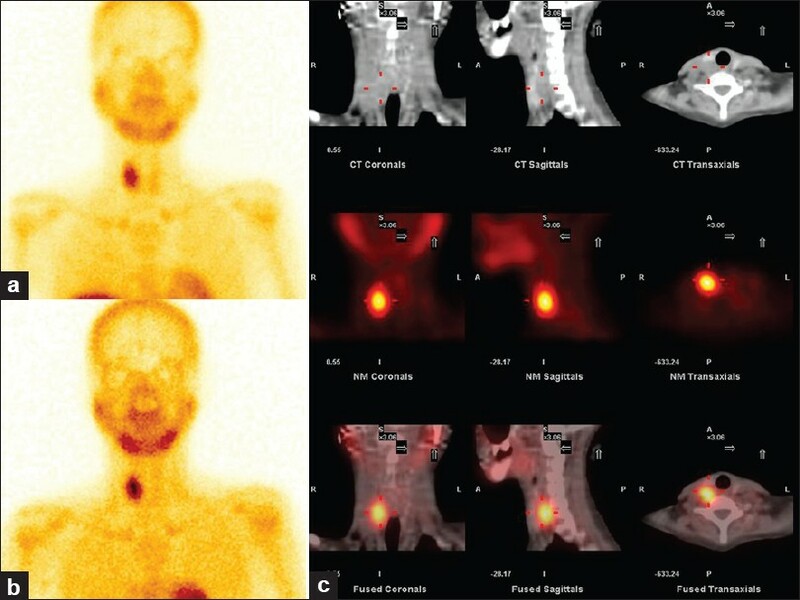 On the early and delayed positron emission tomography images, size, attenuation, maximum standardized uptake value (SUV) and retention indices (RI) were recorded for lymph node characterization. Results: The mean SUV on the early and delayed scan of 118 lymph nodes was 3.3±1.2 and 4.2±1.7, respectively. The mean RI was 26.4±24.5%. Higher FDG uptake was observed in patients with calcified nodules and bilateral FDG uptake and in lymph nodes with calcification or short-axis diameter larger than 10 mm. Conclusion: In tuberculosis-endemic area, the increments of SUV or RI were frequently observed in benign mediastinal lymph nodes, and these values might not be the accurate indicators of malignant disease for mediastinal FDG uptake. Background: The prevalence of coronary artery disease (CAD) in end-stage liver disease (ESLD) being evaluated for orthotopic liver transplantation (OLT) is unclear based on variable definition used for CAD. 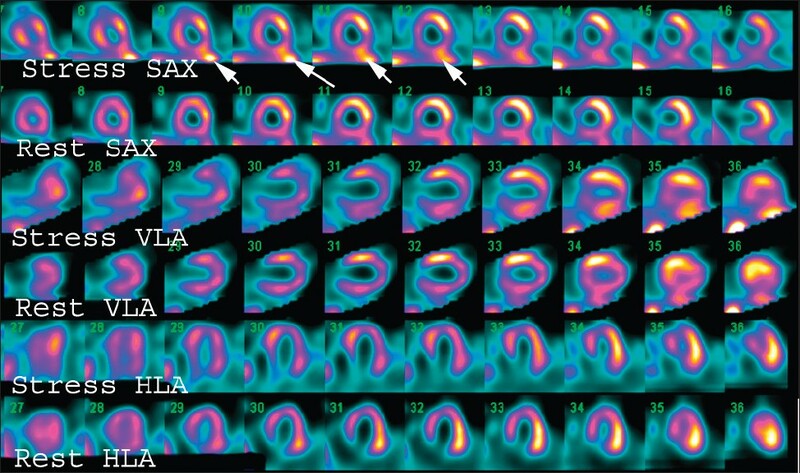 Objective: The aim of this study to investigate the prevalence of abnormal stress myocardial perfusion single-photon emission computed tomography (MPS) imaging, as a marker for CAD, among patients with ESLD who were referred for stress MPS imaging as a routine work up before OLT. Materials and Methods: This was a single-center, retrospective study. We reviewed data on 167 patients who were referred for MPS as a routine work up before OLT over the last 2 years. All patients underwent evaluation for CAD risk factors [age, hypercholesterolemia, diabetes mellitus (DM), hypertension (HTN), and smoking], and stress MPS as per standard protocol. Results: The total number of patients referred for stress MPS was 167. Seven patients (4% of total study population) were excluded from the study due to poor and/or nondiagnostic studies. 147 patients (92%) had normal, but only 13 patients (8%) had abnormal MPS scans. DM and male gender were the most independent risk factors for abnormal MPS with P value of 0.046, and 0.26, respectively. There was no significant association between the abnormal MPS result and HTN, hypercholesterolemia, smoking, age or etiology of the liver disease. Conclusion: Based on our data, the prevalence of abnormal MPS and left ventricular ejection fraction in patients with ESLD was found to be 8%. DM and male gender were the most independent predictor factors for abnormal MPS. True prevalence of CAD and usefulness of MPS in patients with ESLD can only be studied using a very large and randomized prospective study. 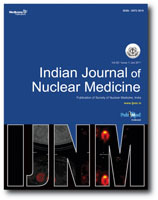 Background: The radiation dosimetric literature concerning the medical and non-medical personnel working in nuclear medicine departments are limited, particularly radiation doses received by radiation worker in nuclear medicine department during positron emission tomography (PET) radiopharmaceutical injection process. This is of interest and concern for the personnel. Aim: To measure the radiation dose received by the staff involved in injection process of Fluorine-18 Fluorodeoxyglucose (FDG). Materials and Methods: The effective whole body doses to the radiation workers involved in injections of 1511 patients over a period of 10 weeks were evaluated using pocket dosimeter. Each patient was injected with 5 MBq/kg of F-18 FDG. The F18-FDG injection protocol followed in our department is as follows. The technologist dispenses the dose to be injected and records the pre-injection activity. The nursing staff members then secure an intravenous catheter. The nuclear medicine physicians/residents inject the dose on a rotation basis in accordance with ALARA principle. After the injection of the tracer, the nursing staff members flush the intravenous catheter. The person who injected the tracer then measures the post-injection residual dose in the syringe. Results: The mean effective whole body doses per injection for the staff were the following: Nurses received 1.44±0.22 μSv/injection (3.71±0.48 nSv/MBq), for doctors the dose values were 2.44±0.25 μSv/injection (6.29±0.49 nSv/MBq) and for technologists the doses were 0.61±0.10 μSv/injection (1.58±0.21 nSv/MBq). It was seen that the mean effective whole body dose per injection of our positron emission tomography/computed tomography (PET/CT) staff who were involved in the F18-FDG injection process was maximum for doctors (54.34% differential doses), followed by nurses (32.02% differential doses) and technologist (13.64% differential doses). Conclusion: This study confirms that low levels of radiation dose are received by staff during F18-FDG injection and these values can be used as a reference to allay any anxiety in the radiation workers. Background: Use of a fixed threshold value for tumor volume delineation in positron emission tomography (PET) images will ignore the effect of size of the lesion and source to background ratio (SBR). The purpose of this Phantom study was to evaluate the effect of the size of the lesion and SBR on the threshold to be used for PET tumor volume delineation. 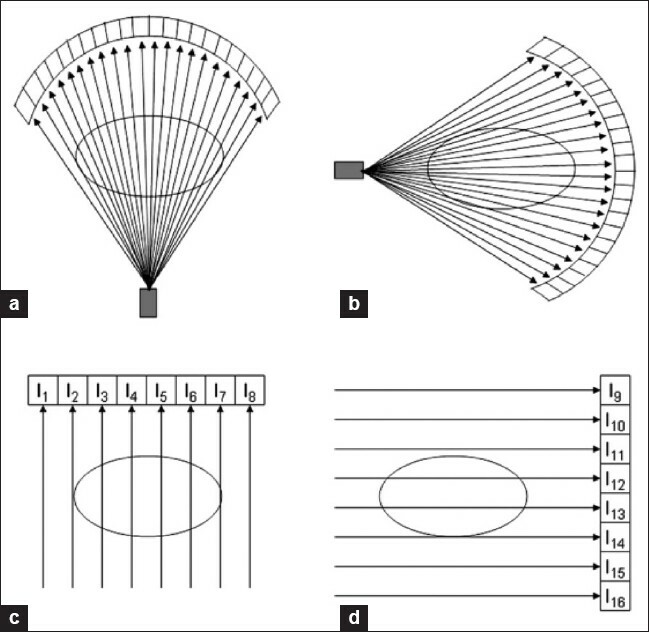 Materials and Methods: Phantom used in the study comprised a sphere-cylinder assembly containing six spheres of different inner diameters (1.10, 1.35, 1.44, 1.50, 1.83 and 1.93 cm) with inner volumes of 0.70, 1.30, 1.50, 1.77, 3.22 and 3.82 cm 3 , respectively. The scans were acquired with SBR of 6:01, 7:01, 8:01 and 10:01. These SBRs were calculated from 42 patients with lymphoma to simulate clinical images. PET tumor volume was calculated using RT_Image software at different threshold values (40, 45, 50, 55, 60, 65, 70 and 75% of SUVmax) for each sphere at different SBRs. The threshold intensity value at which the calculated volume was nearly equal to actual volume of spheres was considered as the standardized threshold intensity (STI) value. Results: STI values depended on the diameter of the sphere and not on the SBR. It is found that 40% threshold is suitable for calculating the volume of any lesion with diameter greater than 1.83 cm, 60% for diameter greater than 1.35 cm but less than 1.83 cm, and 75% for diameter less than 1.35 cm. Conclusion: Size-dependent thresholding is an accurate and reproducible method of tumor volume delineation on PET-computed tomography (CT). A patient who had undergone left radical nephrectomy 11 years ago for renal cell carcinoma (RCC) was referred to our clinic for restaging. Fluorine-18 fluorodeoxyglucose (F18-FDG) positron emission tomography/computed tomography (F18-FDG PET/CT) showed hypometabolic area in left frontal region of the brain and increased FDG uptake in the subcutaneous fatty tissues of the right thigh. Histopathological examination of the biopsy material from the left frontal region and right gluteal region revealed metastasis of clear cell type RCC. Seven months later, a magnetic resonance ımaging (MRI) of right cruris showed a contrast-enhancing lesion with a diameter of 3.5 cm, located at the subcutaneous area of posterior part of right cruris. A concomitant F18-FDG PET/CT detected an increased FDG uptake focus in the proximal third of right cruris adjacent to the muscle planes and this finding was consistent with metastasis of RCC. Tuberculosis (TB) has become a global health concern. Cross-sectional imaging modalities like ultrasound, computed tomography and magnetic resonance imaging play an important role in the diagnosis, assessment of disease extent and response to treatment. 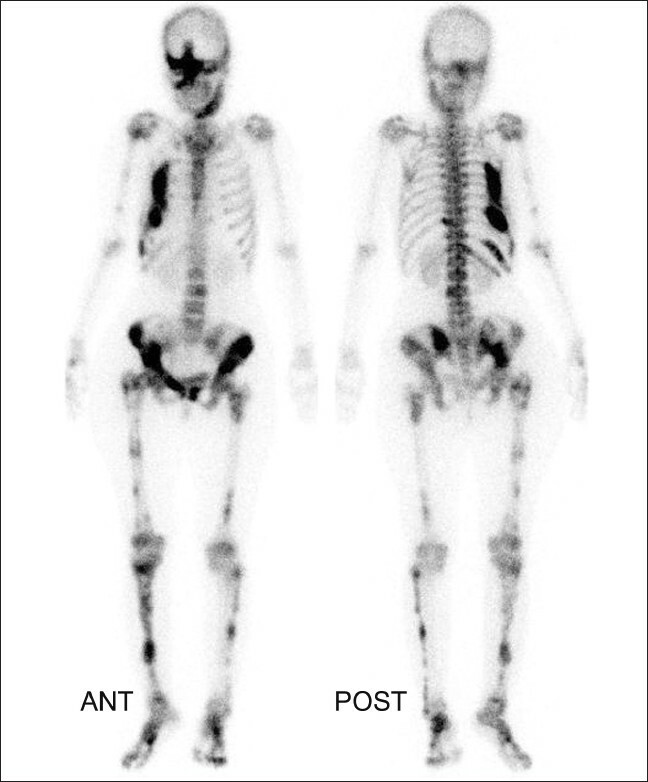 PET/CT, a unique molecular imaging technique, allows the most accurate correlation of anatomic and metabolic information. We report a case wherein PET/CT played a significant role and contributed valuable information in the evaluation of a patient with TB of the hip. A brief review of the existing literature on the role of PET/CT in musculoskeletal TB is also discussed. 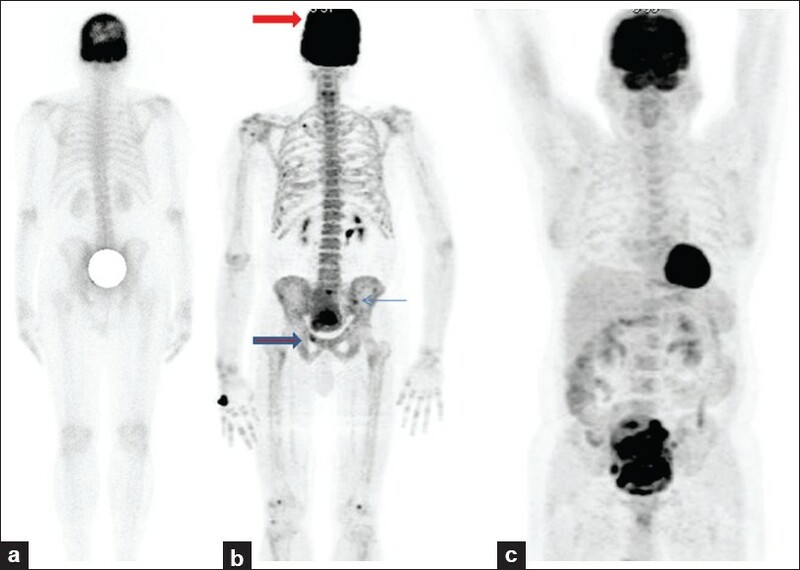 A 73-year-old man, known case of Hodgkin's lymphoma, underwent 18-Fluorodeoxyglucose positron emission tomography-computed tomography (18-FDG PET-CT) for post-chemotherapy evaluation of the disease status. The scan revealed focal increased FDG uptake in pituitary fossa. The CT images showed homogenously enhancing pituitary lesion causing expansion of the sella. A possibility for the presence of pituitary adenoma was raised in the report. Hormonal assay of the patient showed raised follicle stimulating hormone (FSH) level of 18 IU/ml (normal range for males up to 5 IU/ml). All the other pituitary hormones were within the normal range. Nuclear magnetic resonance (NMR) imaging of brain showed a pituitary lesion with expanded sella pushing the optic chiasma superiorly. NMR findings confirmed the presence of pituitary macroadenoma. A final diagnosis of FSH secreting pituitary macroadenoma was made. Polyostotic fibrous dysplasia is a rare progressive benign disorder of the bone. Bone scintigraphy is extremely useful in the initial evaluation for identifying the extent of disease. We report a case presenting with pathological fracture of the shaft of the right femur. After treatment of the fracture, bone scintigraphy revealed involvement of multiple bones including the skull and facial bones. The utility of single-photon emission computed tomography/computerized tomography in the evaluation of the extent of skull base involvement is highlighted. 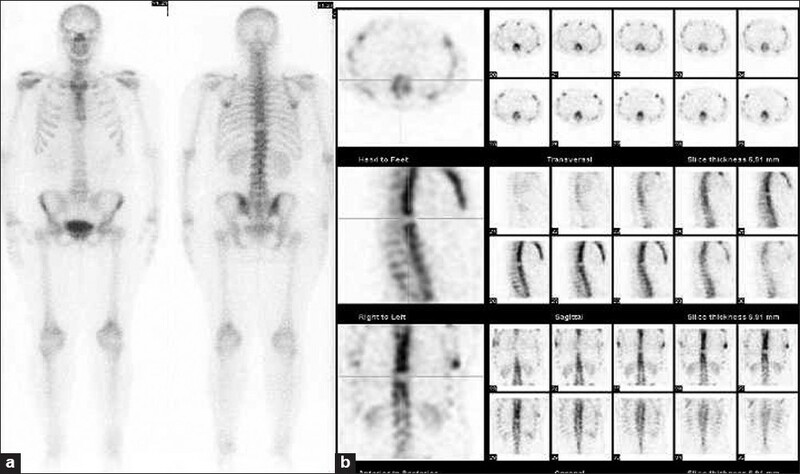 We report the imaging findings of a patient with Paget's disease in metastatic carcinoma bladder evaluated by Tc99m-Methylene diphosphonate (MDP) bone scintigraphy, F18-Fluoride positron emission tomography/computed tomography (PET/CT) and F18-fluorodeoxy glucose (FDG) PET/CT. Tc99m-MDP bone scan showed intense uptake in the skull bones without any other abnormal tracer distribution. F18-Fluoride PET/CT revealed intense uptake in the pelvic bones along with skull bones, but F18-FDG PET/CT showed intense multifocal FDG uptake in the bladder and bilateral inguinal lymph nodes, with no abnormal uptake in the skull bones. CT images showed thickening of skull bones. 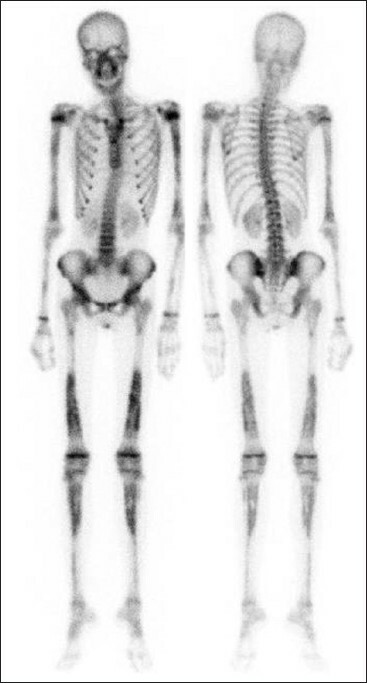 Engelmann-Camurati disease (ECD) is a rare bone disorder characterized by autosomal dominant inheritance. It usually presents in early childhood and is associated with symmetrical diaphyseal sclerosis. We report a 20-year-old female with scintigraphic findings characteristic of ECD. She was treated with corticosteroids and showed marked clinical improvement. 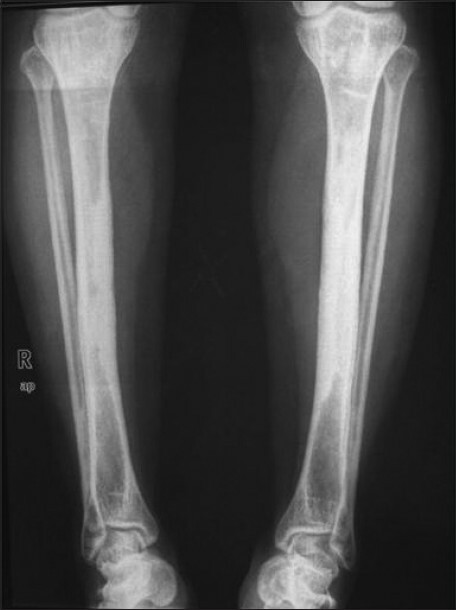 Pachydermoperiostosis is a form of primary hypertrophic osteoarthropathy, also known as Touraine-Solente-Gole syndrome. It is a rare disease. 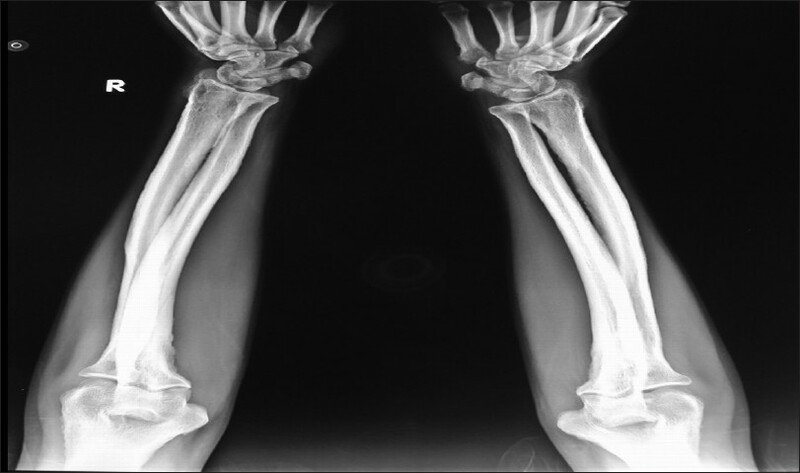 In this report, we present the case of a 29-year-old man with this rare disorder, having significant findings on Tc-99m methylene diphosphonate bone scan. Bone hemangiomas are benign and infrequent lesions. At Tc-99m bone scintigraphy they show variable degrees of radiotracer uptake and even absence of it. 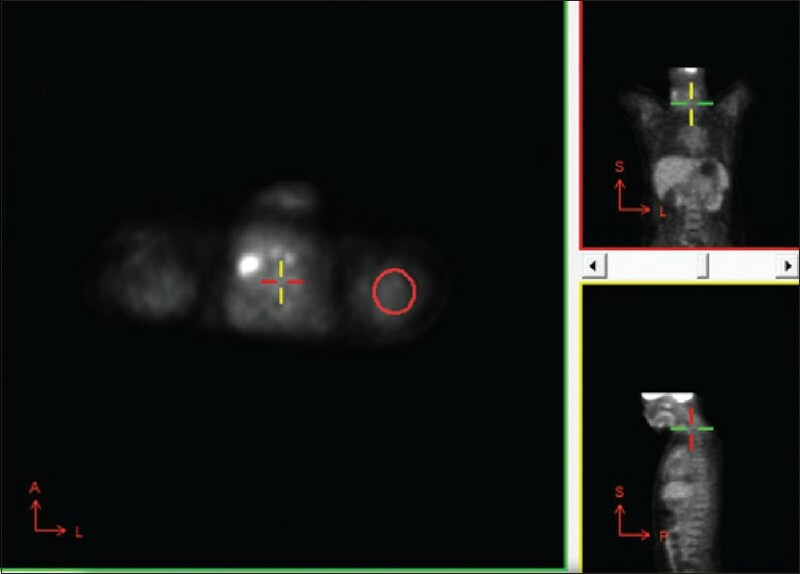 At fluordeoxy-glucose (FDG) Positron Emission Tomography-Computed Tomography (PET/CT), hemangioma is one of the causes of "cold" vertebrae, apart from postexternal radiotherapy. We present a woman diagnosed of breast carcinoma, with a photopenic defect at a thoracic vertebrae at Tc-99m bone scan. 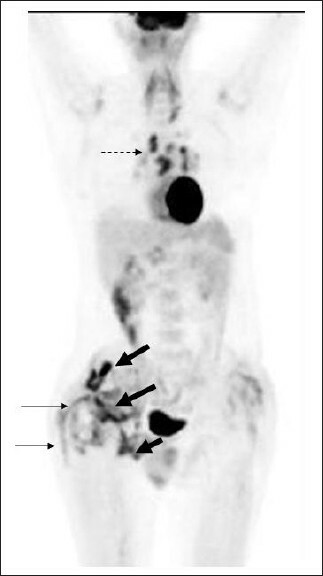 In order to rule out bone lytic metastasis, a FDG PET/CT was performed showing a "cold" vertebrae too. Findings were highly suggestive of vertebral hemangioma, that was confirmed by magnetic resonance imaging.